White_8_12_x_8_12_Square_Envelopes is rated 4.0 out of 5 by 3. Rated 2 out of 5 by llll from Awful These envelopes fall apart so easily. Many of them had come apart before they were packaged, or never sealed properly. Rated 5 out of 5 by Thankful from Exactly what we were looking for! We were in need of a "odd" shaped envelope for mailing of fingerprint charts. Was so pleased to find the envelopes you offer. They were exactly what we were looking for. Thank you! Thinking about ordering the white 8.5x8.5 envelopes to mail 8x8 fingerprint cards, but am concerned about being able to see through the paper. Is the paper thick enough that you can't see through? WE would go with our brite wove choice as to not see through the paper. Just because it's white, doesn't mean it's boring. Just because it's square, doesn't it mean it's not 'in'. Get away from the stereotypes and focus on the greatness of a white envelope. First off, the white color alone is the most popular envelope color, so you can't disapprove of popularity! But we also bring a unique edge in when you find out that these white envelopes are square. 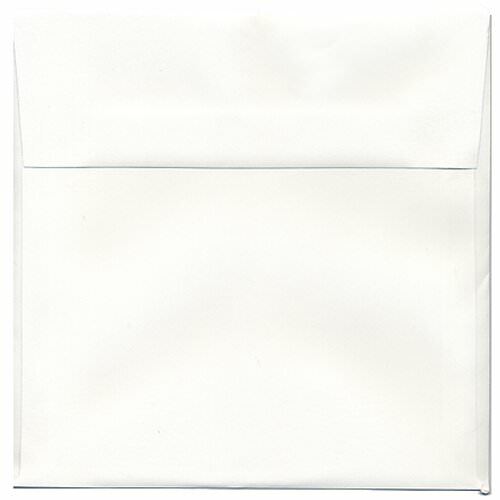 White 8 1/2 x 8 1/2 Square Envelopes are often used for greeting cards, letters, photographs and invitations. An array of white styles allows for you to find the perfect envelope for any situation. From classic white for your business promotions to translucent shades for a cool letter cover, even to bold foil lining for all your holiday invitations! White Square Envelopes measure in at a spacious 8 1/2 x 8 1/2 inches. All variations feature a rectangular gummed flap closure, making sure that your content (whatever it may be) is secure inside and stays secure.